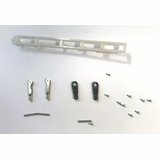 The KST X08H is a version of the KST X08 servo with horizontal mounting lugs (also called mounting tabs), making it suitable for use in wing and other flying surfaces. 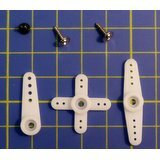 It is especially good for ailerons on DLGs, electric racers, and all models with thin flying surfaces. The gearing has been optimised to improve the torque while keeping an excellent speed. The X08-H can be operated from a voltage as low as 3.8V (1S LiPo) or as high as 8.4V (2S LiPo). 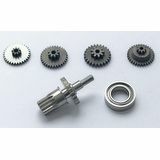 KST improved its geartrain machining tolerances, and this servo is completely slop free, and equal to products costing twice as much. Despite not having an -MG moniker this servo has metal gears, and is very tough. The KST X08H's high torque, good speed, and 8mm thinness make it suitable for many high performance glider, pylon racers and EDF applications. With up to 2.8kg.cm torque the KST X08 is appropriate for F3K, F5D, F5J, many types of high performance models. Feb 2017: We are now only selling the new V5 version (there wasn't a V4) which has improved firmware and electronics, giving even more precise centering and a greater throw. We're pleased you would like to review KST X08H V5 HV Horizontal Lug Servo - 2.8Kg.cm 0.09s 8.4g 8mm. I have KST 08's in all my F5B models, I think they are an excellent product/weight/performace package. As to where to get them, Hyperflight equally a no brainer. Have these in all my DLG’s since the last 3 years. (Snipe, NXT, Vortex 3, CX5) They all work flawlessly.